There’s really nothing that screams weekend more than pancakes. You’ve got more time, less distractions, and more energy in the morning for something other than cereal or a cup of yogurt. You could probably even have the kids help or put them in charge (at least eventually). Growing up pancakes were one of the first things my brothers and I learned how to cook. We each knew where to find the recipe in our trusty, red checked Better Homes and Gardens cookbook. 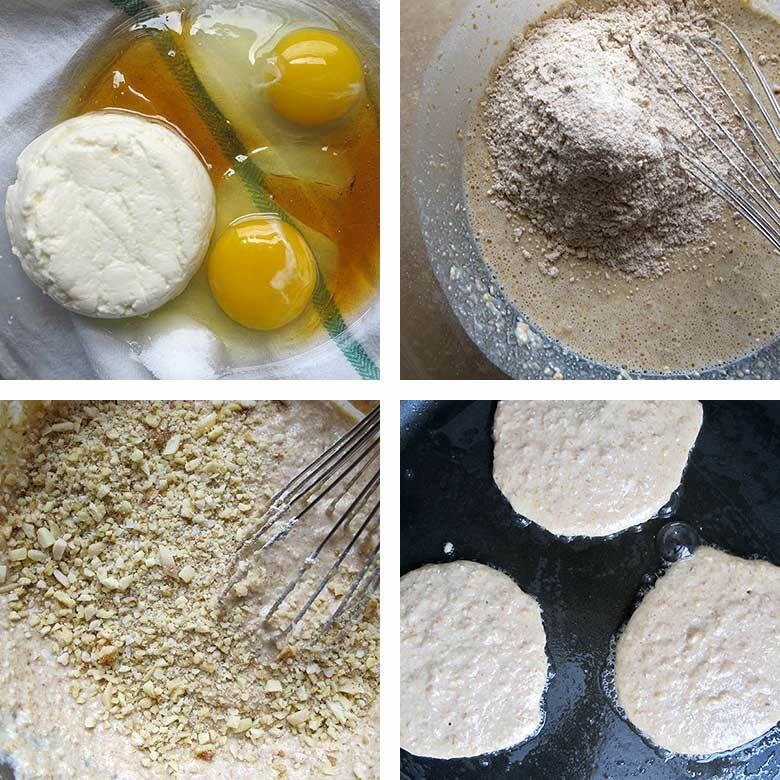 Over time we all learned things like the difference between baking powder and baking soda, how to mix the batter just enough, how to test if the griddle was at the right temperature and then, watching and waiting, waiting, waiting… not entirely patiently… for those first few bubbles of batter to burst and hold their shape. As I’ve grown into a (mostly) responsible adult and learned a few other things about cooking, I do things like try to eat more whole grains and less meat (yes, shocking if you look at my posts so far, but it’s true!). That means I can’t always have my standard pancakes, so, I’ve made these Honey-Nut Whole Grain Pancakes as a hybrid “I’m eating healthy but still treating myself” weekend breakfast. 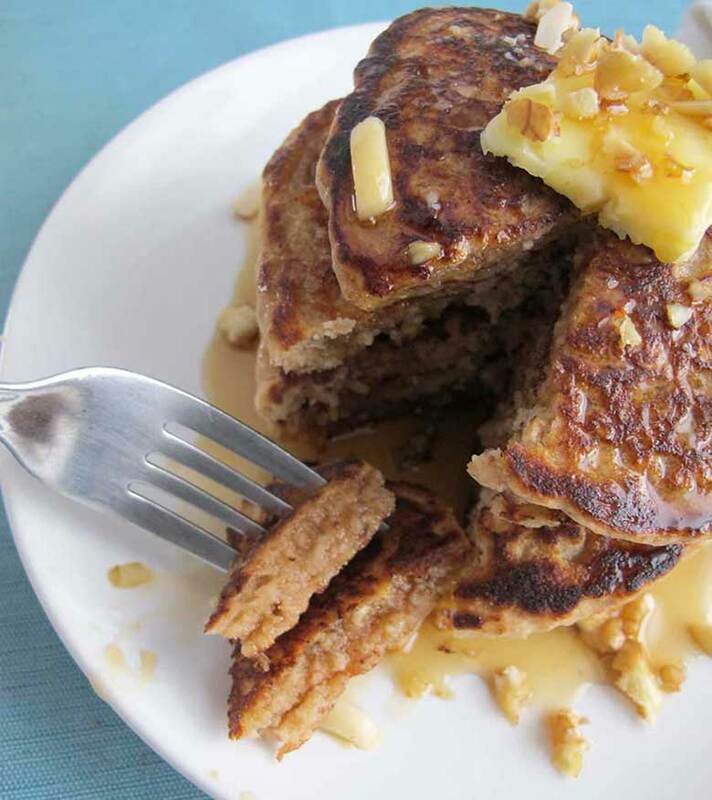 Inspired by the Nut ‘n Grain Pancakes from IHOP, they combine whole wheat flour, wheat germ (there’s the hippie food!) and, of course, nuts, along with a touch of honey for sweetness. They’ll never completely replace my standard pancakes, but they make for a less guilty option to put in the rotation. 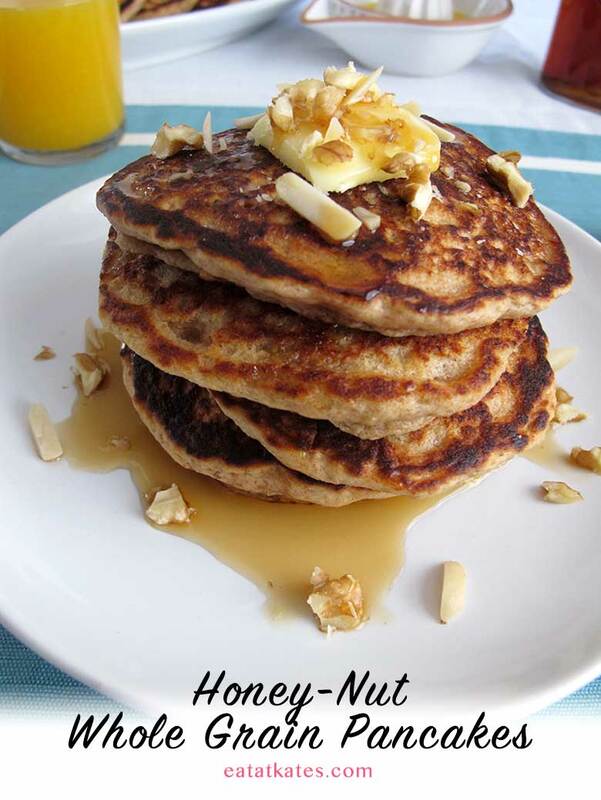 Moist, tender pancakes filled with oats, almonds, walnuts, & a touch of honey. In a large bowl, whisk together ricotta, honey, eggs & salt; mixture will be slightly lumpy. Stir in buttermilk and milk and set aside. In food processor, chop almonds and walnuts. Set aside in a small bowl. In food processor, pulse oats and flours until the oats are finely chopped, but not a powder. 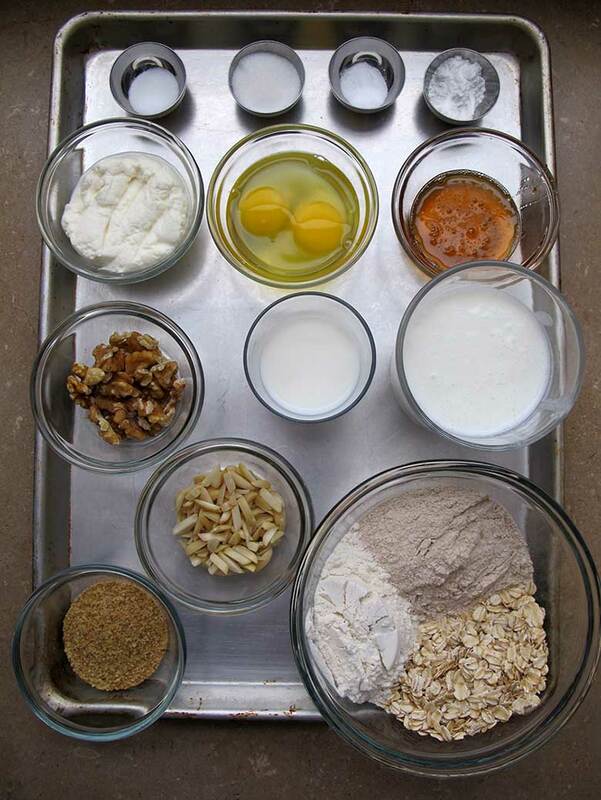 Add oat and flour mixture to ricotta mixture along with wheat germ (if using), sugar, baking powder, & baking soda. Mix together and let rest for 20 minutes. After the batter has rested, mix in the chopped nuts. Preheat griddle or greased non-stick pan over medium heat for 3-4 minutes. Melt butter on griddle; when bubbles have subsided, add batter by 1/4 cupful. Cook pancakes for 2-3 minutes until bubbles are rising, bursting, and holding their shape. Flip and cook an additional minute or two on the second side and remove from pan. You may need to reduce the heat on the pan over time to avoid burning the pancakes. Serve with additional chopped nuts, butter, & syrup. To keep pancakes warm while you cook them, preheat your oven to the lowest temp. Once to temperature, turn the oven off and place a cookie sheet in the oven to hold the pancakes as you cook them.